Skin cancer is the most common form of cancer, and also the easiest to cure if diagnosed and treated early. Left unimpeded, though, skin cancer can lead to disfigurement or even death. Self-examinations should be the cornerstone of your fight against skin cancer. The Skin Cancer Foundation says you should examine yourself once a month from head to toe, looking for new growths, discolorations or changes. Knowing what to look for and when to speak with your dermatologist can save your life. It is a good idea to have your doctor perform your first examination, looking for moles, freckles and discolorations you may not be aware of. Your doctor can then treat areas that need it and advise you on areas that may require extra attention during your self-exams. Melanoma affects the cells that create skin pigmentation, called melanocytes, when they mutate, usually due to ultraviolet radiation (UV) from direct sunlight or tanning beds. Melanoma most often resembles black or brown moles and can develop from existing moles. Melanomas can also be skin-colored, pink, red, purple, blue or white and are easily treatable if found early. Basil cell carcinomas (BCCs) are uncontrolled growths or lesions that grow from the deepest layer of the skin. BCCs can look like open sores, pink growths, shiny bumps or scars. BCCs rarely spread to other areas of the body but are capable of doing so. Squamous cell carcinoma (SSC) is an uncontrolled growth in the squamous cells at the outermost layer of the skin. SCCs can look like open sores, scaly patches, warts or elevated growths that have a depression in the middle. SCCs can occur all over the body, including mucus membranes, but are most common in areas frequently exposed to UV radiation in sunlight or tanning beds. Moles, birthmarks or any brown spot that changes color or texture, increases in size or thickness, is larger than a pencil eraser, has an irregular outline or appears after you turn 21. Any spot or sore that continues to hurt, itch, crust, scab or bleed. Sores that take longer than three weeks to heal. See a physician, preferably a dermatologist, as soon as possible; don’t overlook it, don’t wait to see if it goes away and don’t delay. If you find any sign of skin cancer, it is imperative that you take action before it has a chance to progress. Most skin cancer is caused by exposure to ultraviolet (UV) rays in sunlight. Any time you spend more than a few minutes in the sun, you are at risk for skin damage, especially between the hours of 10 AM and 4 PM. Planning and diligence can keep you safe outside. 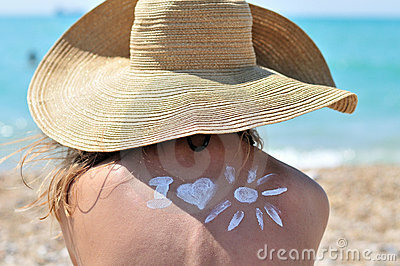 Use the right sunscreen — a broad spectrum lotion or spray that is labeled to protect against (UVA/UVB) radiation. Use a sunscreen with at least a sun protection factor (SPF) of 15 every day and for extended activity outdoors, use a water resistant version with an SPF of at least 30. Apply sunscreen early and often. Your first application should be finished at least 30 minutes before venturing outside. Reapply the sunscreen every two hours or right after swimming or excessive sweating. Find shade, especially between the hours of 10 AM and 4 PM. Cover up with wide brimmed hats, long sleeve shirts and pants. By following these tips you have the power to lower your risk for skin cancer and take fast action if you see any of the warning signs. In addition to your self-exams, it is important to examine children and get them started early on a healthy skin care routine. "Children learn many habits from their parents. Practicing sun protection daily is no different," said top dermatologist Dr. Coyle S. Connolly, president of Conolly Dermatology in New Jersey. "Parents should reinforce the use of sunscreen, sun protective clothing, hats and sunglasses each and every day. Parents should explain to children that too much sun (natural and artificial) causes wrinkles, painful burns and skin cancer."